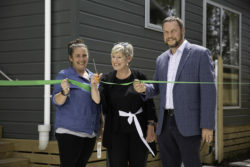 Tenant Melissa Trinder (left), Mayor Lianne Dalziel (middle) and OCHT Chair Alex Skinner (right) officially cut the ribbon opening Louisson Place. On Wednesday 30 January we officially opened the first new development for Ōtautahi Community Housing Trust. We took over management of Christchurch City Council’s 2,300 social housing portfolio in 2016. Mayor Lianne Dalziel officiated at the opening of the complex with the OCHT team, members of the OCHT board, stakeholders, contractors and the community. Located in Louisson Place in Opawa, the eight-unit development includes two four-bedroom and six two-bedroom homes. It will house a mix of families and individuals. Cate Kearney, CE of Ōtautahi Community Housing Trust says the complex is a wonderful addition to the Opawa community. “We are so pleased that we are able to offer these great homes to people in our community and we look forward to welcoming our new tenants. Thank you to all our staff and contractors who have worked hard to relocate these units so that we can provide more homes for those in need,” says Kearney. The eight units are seven years old and have been relocated from the Linwood Park temporary housing village which passed into Trust ownership in 2017. After the successful relocation of the units, our team at OCHT has beautified the development with landscaping, fencing, decking and other improvements to ensure the development fits into its surrounds and meets our tenant needs. Hours: 8.30 am-5.00 pm, Monday-Friday. Click here to see our feedback and complaints policy.